Rational Kitchen has a few articles about the best portable induction cooktops (PICs) on the market. This latest one focuses on commercial portables: What are they--and are they better than consumer grade options? How are they different? Are they worth the extra money? Find out all this and more. This article, Best Portable Induction Cooktop (Commercial Grade, 1800W) was last updated July, 2018. Commercial Vs. Consumer Grade: What's the Difference? What's So Great About Induction? Induction is fast, safe, and very, very responsive--even faster to respond to temperature changes than gas heat. It won't work without an induction-compatible pan on the burner. The burner gets hot only from residual pan heat--yes, it's hot, but not nearly as hot as a conventional gas or electric burner. Because the cooktop itself doesn't heat, it makes cleanup easy: you can wipe it right off with a damp cloth, and there's never cooked on foods to scrape up. In fact, because there's no open flame or heating of the cooktop itself, you can even spread newspapers or paper towels to catch grease splatters if you're cooking something messy. Just roll it up and throw it away when you're done. This also helps to protect the cooktop from scratches if you're using heavy or rough-bottomed pans like cast iron! A portable induction cooker (PIC) is great for when you need an extra burner, such as for holiday get-togethers, and parties. If you're serving a brunch, you can have an omelet station right at the table, with the only safety hazard the cord! PICs are also great if you have big cooking projects that you want to do in the basement or garage. Home brewing, putting up your garden vegetables in the fall, jam and jelly making, maple syrup making, and so much more. There are SO many uses for a portable burner--especially a safe one. PICs are also great for if you want to "try before you buy." Full-sized induction cooktops can be expensive, but portables can be had for less than $50. They can give you a taste of what it's like to cook with induction. Of course, the best portable induction cooktop to simulate the experience of a full-sized one is going to be a commercial-grade one, as the less expensive ones don't have the temperature range or control that the commercial ones do. A PIC is a great way to test the waters of induction cooking without the expense of a full-sized cooktop. Even an inexpensive PIC will give you a good idea of what induction cooking is like--but a commercial grade unit is the best portable induction cooktop to simulate the accuracy and response of a full-sized induction cooktop. Are There Any Cons to Cooking With Induction? Sure, of course there are--there are disadvantages to all cooking technologies. For one thing, you need induction-compatible cookware: it has to be magnetic on the bottom where it comes into contact with the burner. If it isn't magnetic, it won't work with induction. Cast iron, carbon steel, and most tri-ply stainless cookware is induction compatible. If in doubt while you're shopping, read the fine print or ask (either in person or by email). One trick is to carry a magnet with you when you shop so you can test the pan bottoms. For more information, see our Guide to Induction Cookware. A magnet tells you if a pan works with induction. However, portable induction cooktops can be very reasonably priced. While it's true that the best portable induction cooktop is going to cost more (like the commercial ones reviewed here), you can get a surprisingly well-performing cooktop for $100 or less. It won't be as durable as a commercial grade PIC, but it can still be a useful addition to your kitchen. In general, commercial-grade appliances are more durable. This makes sense, given that "commercial" implies an appliance has to stand up to hard, steady usage over a long period of time. In general, commercial-grade appliances are going to be heavier duty both inside and out. Externally, they're going to be stainless or aluminum instead of plastic (for example); internally, they're going to have steel components where consumer grade units can get away with plastic ones. Commercial grade products tend to have simple controls and fewer bells and whistles. They often have fewer options--just turn it on and let it do its thing--but you are paying for high performance that you won't find in cheaper products. They're designed for quick, easy use and, ideally, easy repairs. Which gets to one point that I really, really like about commercial grade appliances: they're designed for repair and re-use, where many consumer grade appliances are designed to be thrown out when they reach the end of their all-too-short life span. This is why, although commercial-grade appliances cost more initially--sometimes a lot more--in the long run, they actually cost less because you don't have to replace them every few years with a new model. Many consumer grade products don't even have replacement parts available, so you can't repair them even if you want to. Pretty much all commercial-grade products are going to offer replacement parts, as well as servicing if you don't want to repair the appliance yourself. You don't have to buy commercial grade products to get good quality. Consumer grade can be just fine for your needs. You just really, really have to do your homework if you want to get the most bang for your buck. Brand names, cost, and even positive reviews are not always a guarantee of a great product. Positive reviews not a guarantee of a great product? Yes, this can be true. Sometimes people mean well when they give a product a positive review, but their lack of experience with the product skews their opinion. This is especially true with technical products like portable induction cookers. To find out more, see Can You Trust Amazon Reviews? The difference between a consumer grade and a commercial grade portable induction cooktop is primarily build quality. This means both externally and internally. Externally, the housing is going to be made of stainless steel. The best ones will be stainless throughout, although some models may have some resin parts on the bottom, where they can't overheat and melt. Most consumer grade PICs have plastic housings. This means they're more prone to damage from heat, and also that they can't bear as much weight. If you cook large stock pots full of liquids, you're going to want a stainless housing on your PIC. Internally, parts are going to have heavy-duty construction, too. The fans, for example, will have ball bearings, which makes them not only last longer, but also makes them quieter. Noisy, rattling fans are a prime characteristic of consumer-grade PICs. They drive some people crazy. Most other internal structures are also going to be of heavier-gauge materials whether steel, plastic, or otherwise. Overall, because of the steel parts and heavier build quality, commercial grade PICs are going to be quite a bit heavier than consumer grade PICs: compare a consumer grade Duxtop 9600LS--a perfectly fine consumer grade PIC--at 7.5 lbs., versus the commercial grade Mr. Induction 183C at 13.5 lbs. Even though they're approximately the same size, the commercial PIC weighs almost twice as much! While all induction cooktops get very hot very fast, cheaper ones have a tendency to not work very well at all temperature settings. Anything less than "hot as it can go" can have disappointing performance--and at simmer temperatures, well, fuggedaboutit. This is because of how PICs are controlled: they pulse on and off as needed to reach the temperature or power setting. Cheaper electronics (found in low-end PICs and even some less expensive commercial or quasi-commercial brands like Max Burton) pulse heat either all the way on (1,800W) or all the way off (0W) with little to nothing in between. Thus, a low temperature setting on a cheaper unit is going to be achieved by pulsing less often, not by changing the amount of the pulsing. This is why you see so many complaints of terrible simmering--from full boil to nothing and back again--or scorched food cooked at a low setting: the pulsing is crude and poorly controlled. You can get decent low temp control in some consumer grade PICs, as well: namely, the Duxtop 9600LS, Duxtop 9100MC, the NuWave Gold PIC, and several inexpensive PICs made by SPT, such as this one. However, they won't have the sophisticated temperature controls of a commercial grade PIC, so you'll still have some of the simmering/scorching issues you get at that price point. When buying any PIC, pay attention to the temperature range. Most start at 140F, but a few start at 100F or lower. This is a significant difference which you will appreciate, whether you buy commercial OR consumer grade. The wider range allows you to do things like melt chocolate without burning and other low temp feats that aren't even possible with full-sized gas or electric cooktops. Commercial grade PICs are going to have easier-to-use controls. Most of them have manual knobs, which make temperature changes easy in comparison to scrolling through a digital menu. While you will get accustomed to whatever controls your PIC has, knobs are still the faster, easier type of control. Look at these two models: which looks like the best portable induction cooktop for ease of control? Digital controls aren't the end of the world; they're just a little bit slower to use. If you only use your PIC for preparing meals, this may not matter to you. However, if you'll use your PIC for long cooking projects (such as stock making), be sure you don't buy one with a short run time. As mentioned above in the Build Quality section, commercial PICs have heavier duty fans that are going to last longer, be more effective, and run more quietly. Fans are an important feature of a PIC because without them, the units can easily overheat and shut down (or worse, burn themselves up). Therefore, you want a good fan. While some consumer grade PICs are going to have good fans, most are going to be cheap and annoyingly loud (often "rattly"). A fan on a commercial PIC might be loud as well, but it won't have a cheap, rattly sound--and you'll know it's doing its job. Cheap fans will wear out quickly. Ball bearing fans run quieter and last longer. As with all other products, you have to pay attention to the details if you want to buy wisely. Not all PICs that call themselves "commercial" are actually commercial grade products. Rather, they use the word "commercial" as a marketing ploy that doesn't speak at all to the quality of the product. Even worse, these PICs are often higher-priced than other consumer-grade PICs with little or no difference in build quality or performance. How can you tell you're getting a true commercial grade PIC? First you have to understand the differences (e.g., build quality, weight, temperature controls, temperature range, fans, etc.). Then you have to read the specifications to see past the marketing jargon to what you're really getting. Reading user reviews can help, but you have to be thorough, making sure to read the unhappy reviews carefully. In short, you have to do your research. This can be a tricky proposition. For example, some PICs might have a steel housing, but poor quality internal parts. And some might be no better at all than competitors that cost a hundred dollars less! The only other alternative is to find a reviewer you trust, and take their recommendations. (Like us!) But even here, you have to be careful. A lot of review sites, in particular those that don't specialize in induction technology, simply don't know what to look for. They base their reviews mostly on performance--but when they compare only to other PICs with similar performance, how can they make a good recommendation? Especially when they don't know those other options exist! PICs are a particularly difficult product to understand, much less give recommendations on. There are thousands of different models on the market, all with different performance claims in a huge price range. It requires a lot of research to know what to look for, and to figure out what makes one PIC a better choice. So whatever type of PIC you're looking for, be sure you trust the advice you're getting, because there really is a lot of bad advice out there. -If a PIC weighs 6-8 lbs, it's got cheap internal components. -If a PIC weighs 9-10 lbs, it's probably got a stainless housing and cheap internal components. -If a PIC weighs 12 lbs and upwards, it's probably a solid, well-made, most likely commercial-grade product. Commercial grade PICs probably have slightly larger burners than consumer grade PICs, but the size varies among brands. On average, the consumer grade burner size is probably about 4 inches, while the commercial grade burner size is usually around 6 inches. For home use, it doesn't make all that much difference. Sure, a bigger burner is nice to have. But if you think about how a gas stove works, the diameter of the flame ring is what, about 4-5 inches? Yet nobody ever voices concern about whether it can heat a 10-inch skillet. The truth is, cookware is made of metal with excellent heating properties. Whatever size the burner is, heat will conduct throughout the pan bottom and even up the sides. Sure, the larger the pan, the longer this will take. But most burners will work well with pans from about 4-inches in diameter to about 10 inches in diameter (across the bottom, of course). With a larger burner, you can go up to 12 inches without issues. However, at this size, you begin to run out of room on the sides of the induction burner (and maybe on the stovetop, too). The point is that burner size isn't really all that big a deal. When you read reviews, you'll see a lot of complaints about "small burner size" being a problem, but that is a misunderstanding of the real issue, which is heat distribution. Between poor quality cookware and inadequate heat pulsing (remember, PICs are powered by pulses of power), hot and cold spots can really be a problem--but with decent cookware and a PIC with decent heating capabilities, uneven heating is rarely a major problem. Do you have to stir food to distribute heat evenly? Do you have to wait for the pan to reach heat equilibrium? Sure you do--but this is true for all cooking technology. It's unfair to single out induction when induction is not the real problem. Inside a PIC: The coil is small compared to the entire cooking surface--yet you are not limited to cooking with pans equal to or smaller than the burner diameter. Commercial-grade PICs require either a 120V outlet or a 240V outlet. The maximum load on a 120V outlet is 1,800 watts. If an appliance needs more than 1,800 watts to run, it's going to need a 240 volt outlet. The maximum load on a 240V outlet is 3,500 watts. Therefore, if you buy an appliance that uses more than 1,800 watts, you'll need to use a 240V outlet. There's a common misconception that all commercial grade PICs are 3,500 watts and require a 240V outlet. This is not true, though. You can get commercial grade PICs with 1,800 watts of power that plug into standard outlets. What would be the advantage of buying a 3,500 watt unit? In our opinion, not that much. They don't get twice as hot. They don't have more settings. The fans are likely to be louder (because there's more power driving them). The advantage is simply that they're very, very fast--and so would be a good choice if you're using a lot of large cookware (the extra wattage will heat large pots and pans faster). But with 1,800 watt PICs being lightning fast to begin with, this isn't an advantage worth the extra hassle of wiring a special plug-in, unless you're buying it for a very specific purpose: for example, if you're a home brewer and want the extra power for heating large vats of liquids. Also, needing a special outlet takes the "portable" out of "portable induction cooker." You can only use it where you have the right outlet to plug it in. Thus, although there are impressive 3,500W commercial PICs available, we are restricting our choices in this review to 1,800W models only. For most people, this is the best portable induction cooktop option. If you're buying a commercial-grade PIC for home brewing or some other specific application that requires a ton of power, go for a 3,500W PIC. Otherwise, the 1,800W with that plugs into a standard outlet is the best choice. For 3,500W PICs, we recommend the CookTek, (high end) and the Avantco (economical end). All consumer-grade PICs come with a warranty; unfortunately, many commercial-grade PICs do not. Or at least, not for home use. Yes, it's true: if you buy a commercial grade PIC for home use, the warranty may be automatically voided. This is because of the difference in wiring between commercial kitchens and home kitchens: most 1,800W appliances require a dedicated 15 amp circuit. If you use the PIC improperly, you can ruin it. This is true for most commercial grade PICs. In fact, if it isn't an issue, it may not be a true commercial-grade product, even if claiming to be. This doesn't necessarily leave you high, dry, and out of luck. If you do decide to buy commercial, try to buy an extended warranty from the third party dealer (such as Amazon). That way, you're covered if something should go wrong and the manufacturer won't honor their warranty. You may think this is a stellar reason to NOT buy commercial grade, but we disagree. The advantages in quality are so great that we believe you should be willing to take this risk--especially if you can purchase a third party warranty for the product. Most commercial-grade PICs of 1,800W require a dedicated circuit to run properly. This means it should be the only appliance on its outlet. Sharing an outlet may void the warranty (if the warranty covers home use at all). If a third party warranty is available, we strongly recommend that you buy it. If you're just talking strictly quality, the best portable induction cooktop is going to be a commercial grade one. The quality level is outstanding. Designed for heavy duty use over a long period of time. Unlimited run time (no auto shutoff). The manufacturer warranty probably won't be honored. Requires a dedicated circuit to run properly. If you want what's arguably the best portable induction burner on the market, the Vollrath Mirage Pro is the one to get. It's performance specs are nothing short of amazing, outclassing every commercial PIC in its class, and even beating out induction cookers that cost hundred more, like this CookTek model. At around $460, the love doesn’t come cheaply. But it is so much better than anything you’d get for less--and many people even believe it’s better than units you’d pay three twice as much for (like this guy). What makes it so much better than other PICs? According to the Vollrath website, it's the Mirage Pro's "G4 Engine." According to Vollrath, "The Mirage® Pro induction ranges feature the G4 Engine, using four IGBTs so the workload is shared across four parallel switches. This increases the efficiency, control and longevity of the Mirage® Pro induction range." And what are some of those cool features? 100 power levels--more even than full-sized induction cooktops. A temperature range of 80 - 525F. A low-end power of 50W, resulting in stellar low-end temp control. But wait, there's more! In addition to its impressive power and temperature specs, the Mirage Pro has some fancy features that really put it over the top. See more in the Features section below. 2 year manufacturer warranty (may not be valid for home use). I don't know why these great features aren't shouted from the rooftops; in fact, they're not even on the Vollrath website. I only found out about them through extensive research and use. But they truly set the Mirage Pro apart from the rest of the crowd. Click here to check Mirage Pro price and reviews at webstaurantstore,com! The Mirage Pro has a three simple buttons--On/Off, Power/Temp, and Timer. It has a green LED display, and a dial to adjust power level or temperature, depending on what mode you're in. You can also select Fahrenheit or Celsius temperature mode. The screen is covered with tough plastic and angled away from the surface area, which is a great safety feature. Green LED display/push button mode settings/dial to select power/temp level. 180 minute timer with auto shutoff; unlimited running time if timer isn't used. *Note: The Vollrath website gives 14-inches as the max pan diameter, but this doesn't seem right since it is the entire width of the unit. The Vollrath 59500P Mirage Pro is probably the best portable induction cooktop available, with the widest range and the most sophisticated temperature control. You may not need 100 power levels, but they make it a joy to use. If you want the best of the best, this is the PIC to get. Sunpentown makes a diverse and very usable range of induction cookers, from inexpensive consumer grade models to high end 3,500 watt commercial grade ones. Mr. Induction is a solid, dependable choice for a commercial grade cooker, with easy-to-use controls and plenty of power options. As for durability, the Mr. Induction 183C is one of the best portable induction cooktop options available: it's as tough as they come. It doesn't have the fancy features of the Mirage Pro, but it doesn't have quite the price tag, either. If you decide to go with the Mr. Induction, we strongly recommend buying from Amazon and purchasing the extended Amazon warranty. Sunpentown will not honor the warranty on this PIC if it's purchased for home use. Check out the Mr. Induction price and reviews on houzz.com! 1/2 yr. mfr. warranty parts/labor. Not applicable for home use. As you can see, operating the 183C is as easy as turning it on, selecting the mode, and flipping the dial to the setting you want. Accommodates pans approximately 4 - 11 inches in diameter; you can use larger pans but may not get even heating throughout. Warranty probably won't honor home use. The Mr. Induction 183C is one of the best portable induction burner options on the market. It's made like a tank, has a good temperature range, and enough power levels to provide excellent control. If you want solid performance at a respectable price, this is the PIC for you. Since the warranty probably won't cover home use, be sure to buy the extended warranty--for this reason, we recommend purchasing from Amazon (which typically has the lowest price, as well). The Vollrath Mirage Cad﻿et 59300 portable induction cooktop (see it on Amazon) is the Mirage Pro's little brother. It isn't as powerful or as impressive, having G1 internal components rather than the G4 of the Mirage Pro. This means it isn't going to have the sophisticated temperature controls, and it probably isn't going to stand up to hard usage quite as well. However, it's about half the price of its big brother, too, so there's that. The Mirage Cadet is a commercial unit designed for use in the food service industry, though, so it's durable and heavy duty and will hold a temperature down to 100F (although with a less precision than the Mirage Pro). In other words, the Mirage Cadet is Vollrath's standard commercial PIC, meant to compete head-to-head (I assume) with Mr. Induction and many other commercial induction cookers with roughly the same specs. One thing it lacks is a dial control, so you have to use push buttons to set modes and select temperature or power levels. In my opinion, this is a big miss. However, the Cadet is from Vollrath, and it's a decent choice if you want middle-of-the-range power and excellent build quality. If trying to choose between the Cadet and the Mr. Induction, it may just come down personal preference: which one's appearance do you prefer? Is the dial a big miss for you? Oh, and the Cadet is going to be about $100 less than Mr. Induction. So there's that, too. And always remember, if you buy this for home use, buy from a site that offers an extended warranty (like Amazon), as the Vollrath warranty probably won't honor home use. CHECK OUT THE VOLLRATH MIRAGE CADET PRICE AND REVIEWS ON AMAZON﻿! CHECK OUT THE VOLLRATH MIRAGE CADET PRICE AND REVIEWS at webstaurantstore.COM! 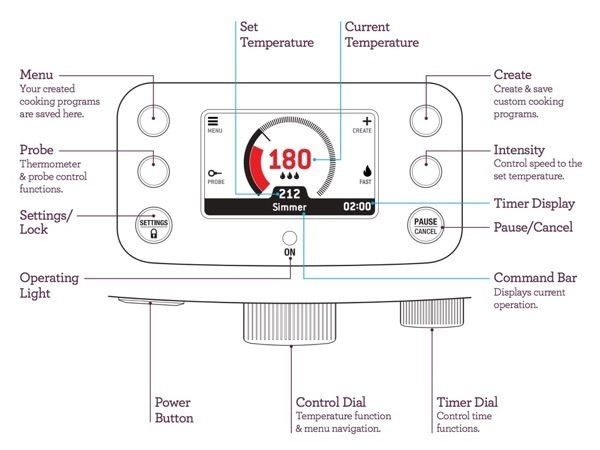 The Vollrath Mirage Cadet has a pushbutton control panel, with Up/Down arrow keys to adjust whatever mode you're in (e.g., power level, temperature, or timer). We prefer the rotary dial on the Mirage Pro and the Avantco, but if you want all digital controls, the Cadet is probably your highest-quality option. Many of the same standard features. Warranty may not be honored if purchased for home use. The Vollrath Mirage Cadet isn't the best portable induction cooktop out there, but it's a solid choice at a reasonable price point. If you hate the idea of pushbutton controls, go with the Mr. Induction. If you want the Vollrath name but don't want to pay for the Mirage Pro, get the Cadet for half the price. It doesn't have the cool features of the Pro, but it's more than adequate for basic use. It won't have quite the low temp control of the Mirage Pro, but it will be better than any consumer-grade PIC. If you do go with the Cadet, our recommendation is to buy from Amazon and get the extended warranty, as Vollrath is unlikely to honor the manufacturer warranty if you buy this cooker for home use. Avantco manufactures many kinds of restaurant equipment. It was hard to find information on the company, but it looks like they're an American company that manufactures overseas (probably in China). I'm not sure that's true of all their products, but it seems to be true of their portable induction cooktops. Avantco market the IC1800 as a "midrange" model: made for medium usage rather than heavy duty usage (although what exactly that means in the restaurant world, I'm not sure). For a home user, this should provide more than adequate durability. The IC1800 is kind of a hybrid: it has the build quality of a commercial-grade PIC with the internal components of a consumer-grade model. This is certainly reflected in the price, and why Rational Kitchen recommends it as an economical choice: you get a solid unit, but it's not going to perform much better than most consumer grade products. But at this price, you shouldn't expect it to. If you buy the Avantco IC1800, we recommend going to webstaurantstore.com as they have the best price by far. However, you may have to forego the security of a warranty because this site doesn't offer a third party warranty. Our advice is to keep checking Amazon, and pounce when the price comes down to the webstaurant price (around $120). CHECK OUT THE Avantco ic1800 PRICE AND REVIEWS ON AMAZON﻿! CHECK OUT THE avantco ic1800 PRICE AND REVIEWS AT WEBSTAURANTSTORE.COM! Like all commercial PICs, the Avantco !C1800 has easy-to-use controls. Use pushbuttons to select the mode you want, then use the dial to adjust the setting. Accommodates pans approximately 4.75 - 10.75 inches in diameter; for best results, use pans from 4.75-8.0 inch diameter bottom. As powerful as many other commercial grade PICs. Manufacturer warranty may not apply for home use. If you're looking for commercial grade quality at a price barely more than a consumer grade product, the Avantco is the one to go for. It has a smaller temperature range than other PICs but if that doesn't bother you--if you'll be using it primarily for high heat applications-- it's one of the best portable induction cooktop options out there for the money. NOTE: For the best price, check out webstaurantstore.com--it's usually much lower than the Amazon price. The Breville PolyScience Control °Freak® is "the world's first induction cooker that can set and hold any temperature from 86 DegreeF-482 Degree for any length of time." It came out in early 2016, and as induction cookers go, it's really a bit of overkill. Does any cook really need this level of accuracy? We've gotten along so far with nothing but a handful of settings, thermometers, and our own eyes to guide us, and we've managed to make dishes that require a fair bit of accuracy (e.g., candy, medium-rare steak, and anything baked in the oven). PolyScience is a laboratory equipment company that's been making immersion circulators and other lab machines for quite awhile. Since the sous vide craze hit a few years back, they've been making precision culinary equipment, as well. If you want to learn more about their culinary products, click here. I suspect that this level of control is aimed at sous vide users: it's like having a sous vide water oven that you can use your own pot for. Because really, sous vide is the only application I can think of where a degree or two of temperature fluctuation can make a difference. Although at this price, you could buy an immersion circulator and a really nice PIC a few times over and have achieve similar results. However, it does offer a few extra options that regular (with a pan) cooking can benefit from. For example, you can control the rate at which it heats, not just the temperature. This means extra control for delicate foods. Unfortunately, even with all this control, many users complain that the Control Freak will still overshoot set points before settling into its precision-controlled setting (although to a lesser degree than other cooking technology). This isn't so much a shortcoming of the unit, but rather an inevitability built in to the science of cooking: whatever method you use, there's always going to be some lag between the set temp and the actual pan/food temp. In other words, the Control Freak is not a magic fix; as with any other cooking technology, you still have to keep an eye on it. There are a few other products on the market that do what the Control Freak does: namely, hold temperatures to an exacting accuracy while providing fast, powerful, and impressive performance on pretty much every level. This one, the Hestan Cue, even offers more guidance for the home user. However, none of these products (including the Hestan Cue) have really caught on with the public--which kind of proves our point about "who really needs this much accuracy, anyway?" One serious drawback of the Control °Freak® is that the temperature probe is not replaceable: if you break it, you have to buy a whole new unit to replace it. At this price point, that's absurd--and something the folks at Breville/PolyScience should remedy. In any case, the Control Freak is impressive and cool, even if unnecessary. We include it here more as a point of interest/comparison than as a real option. PolyScience has hinted about bringing a consumer-grade version of the Control Freak to market, at a much more reasonable price, but that hasn't happened yet. Designed in USA, manufactured overseas. See control freak PRICE AND REVIEWS ON AMAZON﻿! see control freak PRICE AND REVIEWS AT WEBSTAURANTSTORE.COM! The Control °Freak® has a color digital display and manual dials for fast setting changes. It also has a temperature probe and an exposed (though very durable) temperature sensor on the cooking surface for more accurate temperature readings. While this is a fabulous PIC, built like a tank and more precise than anyone really needs, at it's exorbitant price, we can't really recommend it. Wait for the home version to come out, or buy a sous vide circulator and a Mirage Pro instead (you'll still spend less if you go this route). You don't have to buy commercial-grade products to get top notch quality. But if you want good quality, going the commercial route narrows the options, and the confusion, considerably. If you're going to spend the extra money, you should get: a wide temperature range, better temperature control, and tank-like durability. These are the things to look for in the best portable induction cooktops of the commercial variety. What are your experiences with commercial grade PICs? If you have any thoughts or questions, please share them in the comments below. And thanks for reading!